This map is only available folded. There is no option to ship it in a tube. 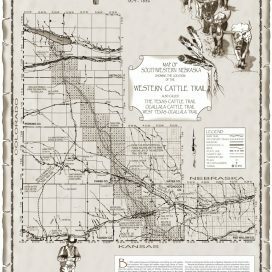 This map has been heavily used by Gary and Margaret Kraisinger in their research on the Western Cattle Trail. 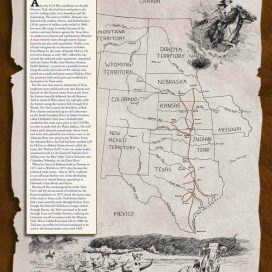 The map shows the “Texas Cattle Trail” (Western Cattle Trail) on one side and the “Chisholm Trial” on the other side. 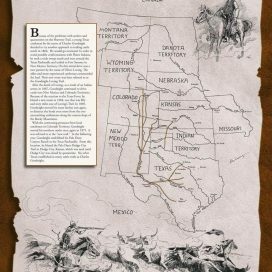 It was originally copyrighted in 1936 by the Oklahoma Historical Society. 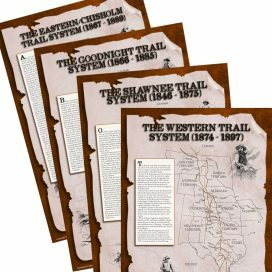 The locations of the trails are based on research done by H.S. Tennant and the Engineering Department of the Oklahoma State Highway commission, as mandated by House Bill 149 in 1933.